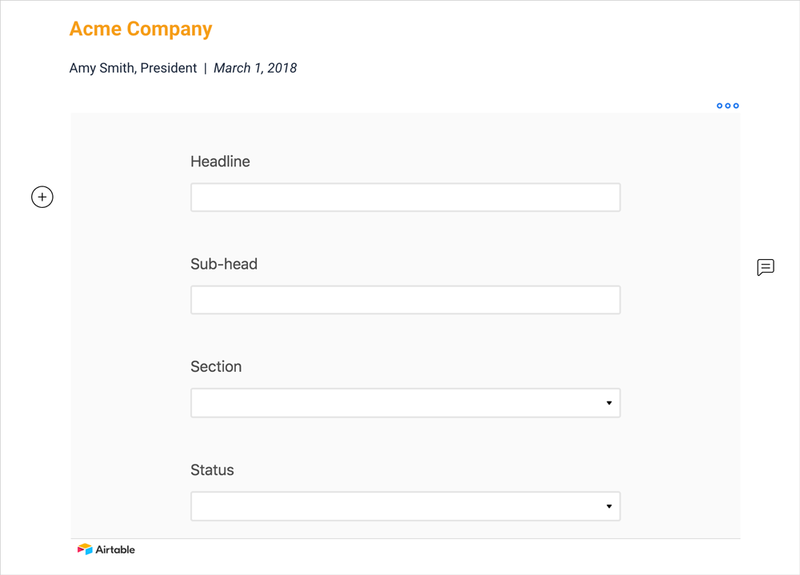 Learn how to embed Airtable inside a document as an iframe quick and easy! Every professional uses or has used spreadsheets at some point in their career. Spreadsheets have been a part of the computer ecosystem since the dawn of computers. They are are awesome tools to manage large databases and carry out complex business as well as personal problems. However, they haven’t evolved much since they were first introduced in 1969. Do you love working and managing projects in spreadsheets, but feel restricted at times because you aren’t able to move beyond text in cells? Typical spreadsheets haven’t evolved in the way they work in decades. They have just moved from typical PC based tools to cloud applications. If you want a more modern and advanced spreadsheet tool that doesn’t belong in the 80’s, Airtable is just the tool you need. Airtable makes the often boring and mundane task of adding, managing and collaborating data a lot more intuitive. With their colorful interfaces and easy to use mobile and desktop apps, Airtable brings flair and fun to your plain spreadsheets. Airtable’s customizable interface allows it to work dynamically with every team’s unique needs. If you like searching and filtering then you’ll find Airtable to be a powerful database for project management. Airtable allows users to switch their data to a grid, gallery or even a Trello like Kanban view. You don’t have to stick with the spreadsheet view of your work. How cool is that?! You can add any type of content- long text notes, checkboxes, attachments or links to records in other databases to Airtable’s highly flexible data fields. Airtable can even be integrated with your favorite office apps like Slack, Gmail, Dropbox, Google Drive, Zendesk, and even social media platforms like Facebook, Twitter, Instagram etc. With a user base boasting of Tesla, Buzzfeed, and Airbnb, Airtable is a great alternative to typical spreadsheet software. 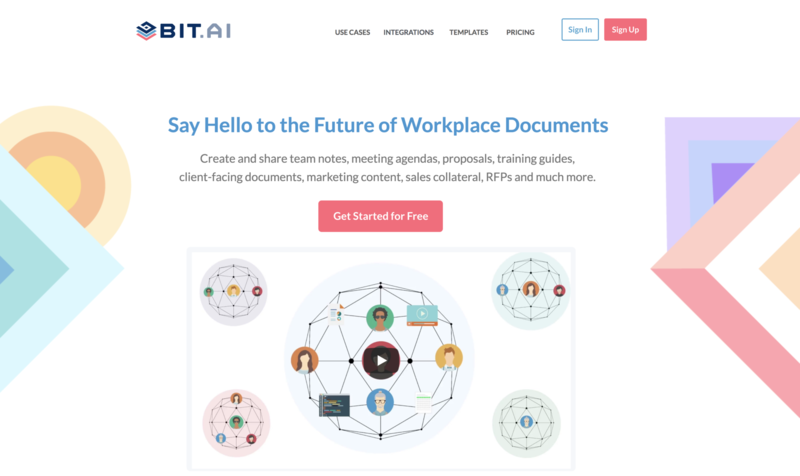 Apart from allowing multiple users to collaborate on documents, Bit also allows users to share any sort of rich media like YouTube videos, SoundCloud Playlists, embed Google Sheets, Docs, and Slides, One Drive Excel Spreadsheets, GIFs, Tweets, Cloud files, Pinterest boards, etc. Basically, anything on the internet with a link (i.e. www.example.com) can be shared and Bit will automatically turn it into visual content. With Bit, you can copy and paste any Airtable base weblink on a blank line of a Bit document and hit enter. No more dealing with messy iFrame/embed code! Embed Airtable inside a document in seconds! But why embed Airtable in a Bit document as an iframe in the first place? Flow can be a wonderful thing. When you are in the zone, you work tirelessly on achieving your tasks and as a result, finish what you started. However, in a world of constant distraction, maintaining that flow can be challenging. You create your files in a document editor or excel, share them via email, get notified about the email via a messaging app, and store it in the cloud. 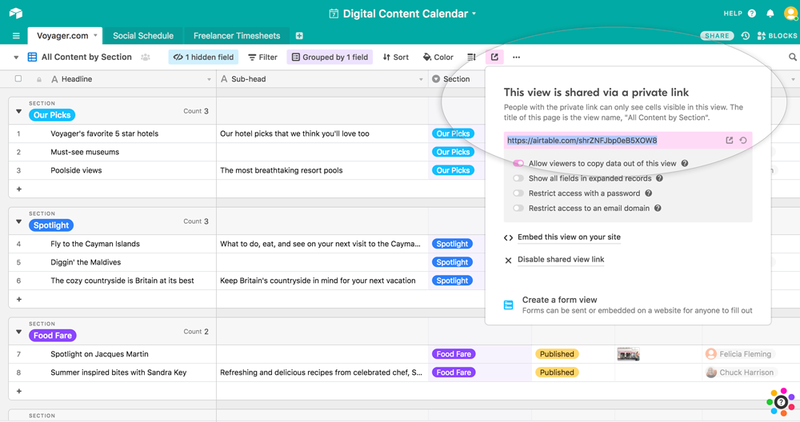 Even while providing feedback or suggestions, you share the content link on Email, Slack, Trello, Google Docs, Dropbox, or any other of the thousands of collaboration tools out there. When you have your important content scattered around different devices and tools, your productivity always take the backseat. it becomes all too easy to get lost in a sea of browser tabs, and that flow we talked about earlier; that becomes a thing of the past! Work Together with your Team! 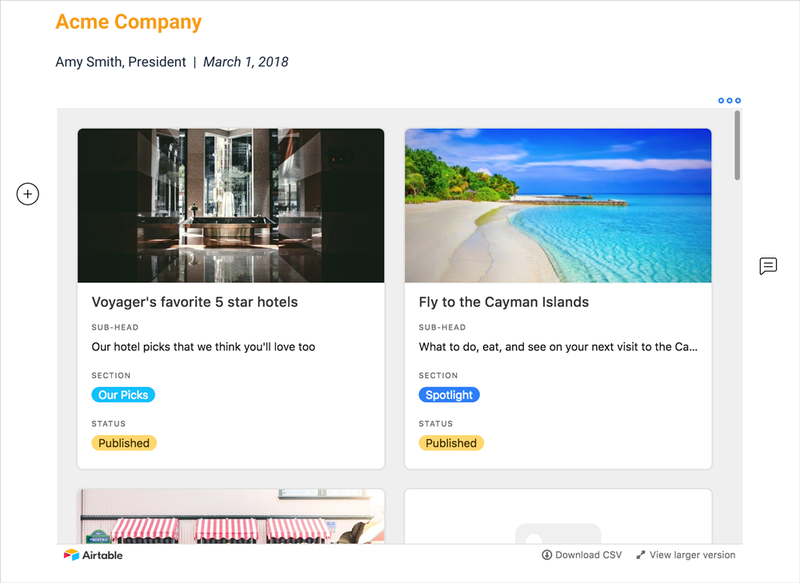 Embedding an Airtable base inside a Bit document allows you and your team to communicate and collaborate in a single location. Also, it makes the process of sending client facing material like client reports, partnership materials, etc. 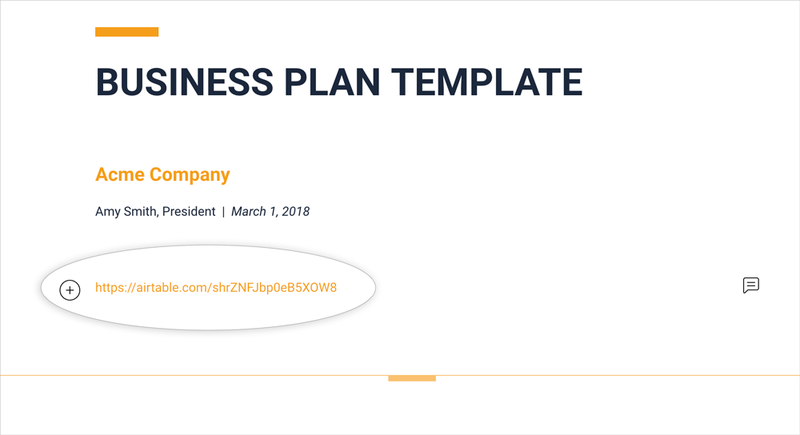 easy as you can put all of your content as well as the spreadsheet in a single document. No more email attachments and confusing messages! Sometimes you want more than just numbers to tell your story. You need context, information, and text to make your peers and teammates understand what Airtable is all about. 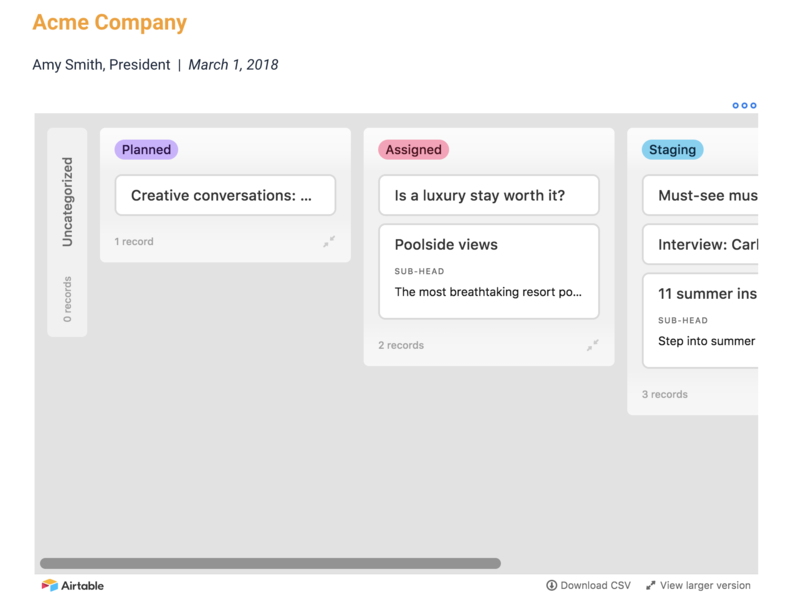 Embedding an Airtable base inside a Bit document provides you with that much-needed space to discuss, give suggestions and feedback, and collaborate effectively- without people being lost and feeling confused. With Bit, you can copy and paste any Airtable weblink on a blank line of a Bit document and hit enter. 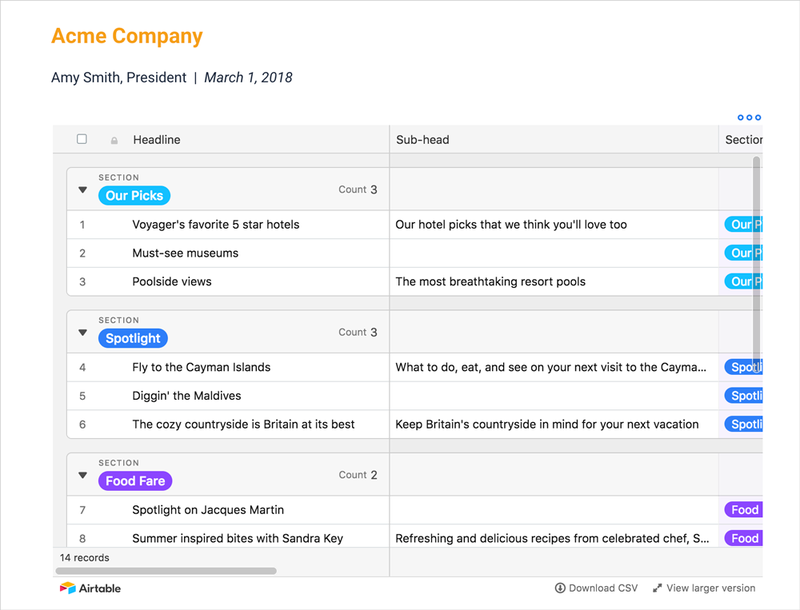 Yes, that includes all Airtable views like Grid, Form, Calendar, Gallery, and Kanban. No more dealing with messy iFrame/embed code! 1. 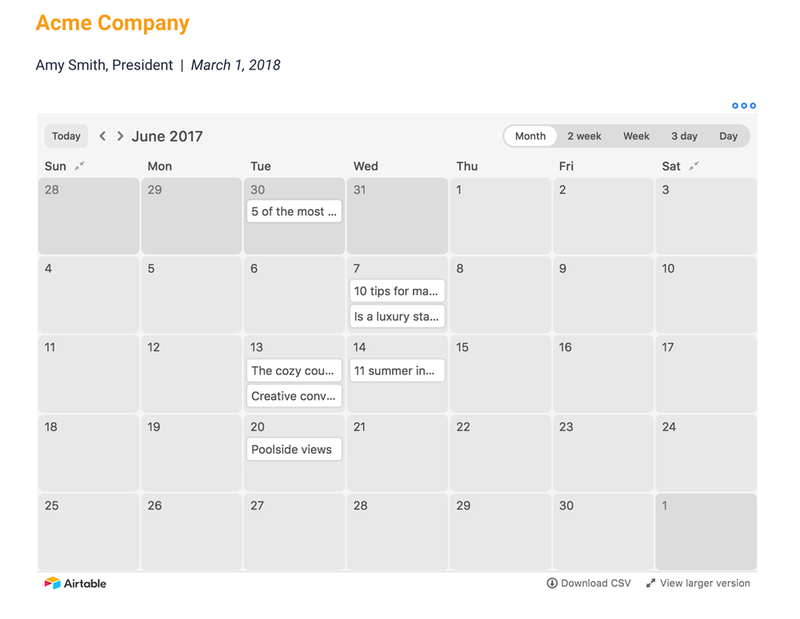 Choose the view you want to embed: Airtable Grid, Form, Calendar, Gallery or Kanban Board and filter your content. 3. Go to Bit.ai and paste the Airtable weblink on a blank line and hit enter. 4. Bit will automatically fetch the Airtable and display it like this. So there you have it. Easily embed Airtable bases in your Bit document by the click of a button! If you like using Airtable, you would love how easy it becomes to work in teams when you can embed it in a document. So what are you waiting for? 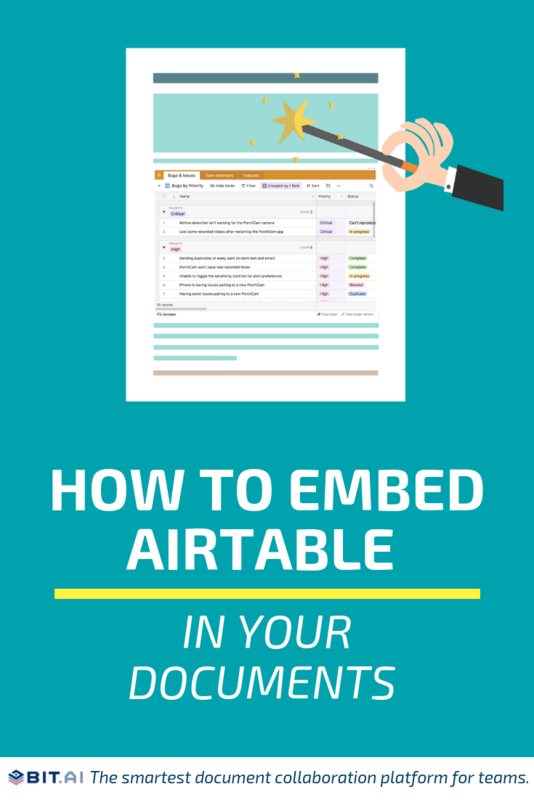 Go ahead try embedding Airtable in your Bit doc and get to work!